During the day, Jesus taught the people in the temple area. At night he went out of the city and stayed all night on the Mount of Olives. Every morning all the people got up early to go listen to Jesus at the temple. 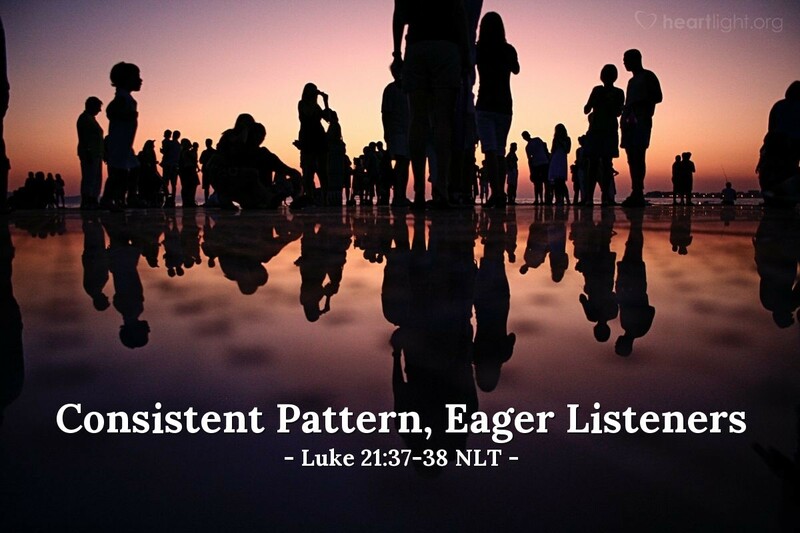 Jesus found eager listeners. His habit during this last week in Jerusalem was predictable. If folks wanted to find him, they could. The Mount of Olives was his place of rest and prayer. The Temple was his location during the day. The people could find him, and they did. They drew near to listen to him. Little did they know they were hearing his last words. But, we know they were his last words before his fretful hours with the disciples and his trip to the Cross. So let's draw near and listen carefully and ask God to help us hear what was on Jesus' heart. Let us give thanks that God has chosen to reveal himself to us in such a human way. Father, how can I thank you for letting me overhear the last words of Jesus as he speaks to the crowds in the Temple, goes to the Mount of Olives, and ultimately goes to the Cross? Help me to not only hear his words, but also to be touched and changed by them. In Jesus' name I pray. Amen.